So, allow me to introduce you to Berkeley’s South Side. It’s where the undergrads live, along with the park-dwelling hobos and “Money for beer”-sign-carrying panhandlers. It also has this awesome vacant lot. In this lot, there are rats. The world is a horrible place. As evidence, consider these creatures. Dan Savage has written a very good post about why opposing health care for all is anti-family. I was impressed, and decided to share it here. I hear that crows are some of the most intelligent birds. What I’ve noticed lately is that they’re also some of the most belligerent. Several times in the past few weeks, I’ve seen crows in what seems like combat. They’ll aggressively fight for altitude, then one will dive at the other, which will turn upside-down, so they meet claw-to-claw for an instant before they fall apart. The incident ends when one crow flies away or roosts somewhere. The giant, lovely eucalyptus tree out my back window has been a focus of such activity at least once. Someone suggested to me that this isn’t combat, but instead is mating behavior. Finally today I saw evidence that they’re wrong, when a crow chased away a seagull. Unless that crow was pretty broad-minded (and the seagull wasn’t), I’m pretty sure that wasn’t mating behavior. 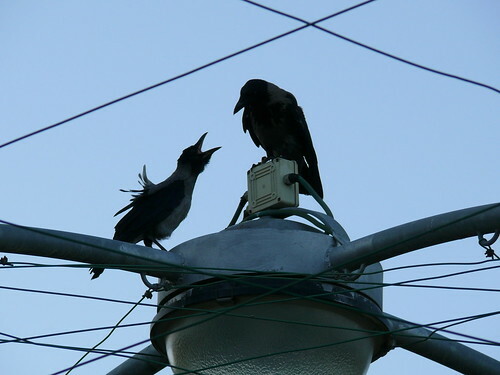 And now, a picture of angry crows ten time zones away (where the dominant crow species is the “hooded crow”). I’ve begun suffering from some repetitive stress ailment in which my right wrist is strained when I angle it right. I’ve finally figured out that it’s from typing–all that reaching to the right for the damn important keys. Enter, backspace, and shift all require that I move my wrist pretty severely, and, especially when programming, those keys get hit quite a lot. I could move my whole hand, instead of just my wrist, I guess, but that’s really slow. Obviously, the right solution is one of those Kinesis keyboards that puts the control keys under your thumbs. I mean, seriously, that’s obviously the right design. Why am I wasting two thumbs on one space bar?! Unfortunately, spending $300 on a keyboard seems a little excessive, especially since I don’t need all the ergonomic features, just the important keys under my thumbs. Do you happen to know of a keyboard that does this but doesn’t cost an arm and a leg? EDIT: In the mean time, I’m attempting to get around this by mapping some keys. Caps-lock is now backspace, and the damn Windows key is now a return key. And I’ll try to use left-shift, if I can remember. That should be much better on my wrist for now. 2 Sundays ago, I did a fund-raising 5K run for Multiple Myeloma, in honor of my mother. I was pleased with my running (I didn’t stop to rest, this time), but more importantly, I raised an astonishing amount of money on my mom’s behalf. I hadn’t expected other people to donate much (I really do hate asking for donations), but the total donation was $370! (No, that’s not $370 factorial, though that would be an impressive donation.) Thank you very much for your help! That, and not the running, was the real triumph. I am astonished and impressed to get so much support for Ellen. In other news, I also went on a hike to Mt. Diablo. It was very nice, and pleasantly green for California. I’d recommend it to anyone. Here are a few of the better pictures. I’ve found my first gray hair! It’s an arm hair, but that still counts. Hooray! Now all those people who claim I’m not old can finally shut the hell up. Chester, my one remaining guinea pig, had a tooth extraction on Thursday. His tooth had started growing in crookedly, so it, and the matching lower tooth, had to be pulled. On Friday morning, he was recovering well, but on Friday night he seemed a little lethargic, and when I woke up on Saturday morning he was dead. Recently dead–still soft and floppy, and not yet cold. Within half an hour, though, he began to get cold and stiff. That’s a pretty stupid idea. The reason you dance that way only in private is because people will laugh at you for it. Is Purkey trying to make fools of us all? You might as well say, “talk like no one’s listening,” or “dress like you’re staying home all day.” We try to control how we appear to other people, and for damn good reason. My time was 22:06, setting a personal record for me. My calculator says that’s 7:07 minutes per mile, which isn’t too bad either. I’ll write a little more about it, but now I’ve got to go see Mount Diablo.